Use the touch pen or simply a pointed finger to control the MiniTouch printer. Illustrative, easy to understand icons lead you through all phases of building your printjob making printing simple and fast. The controller can easily be mounted on a ½" or 1" printhead for sideprinting. This gives you a compact unit with the touch interface right where the print is executed. 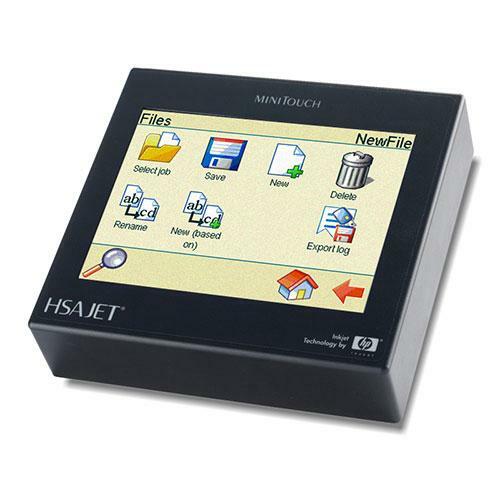 The HSAJET® MiniTouch MT-HP4 can control up to 2" printheight. The HSAJET® MiniTouch is based upon the reliable HP TIJ2.5 technology which delivers consistent, high-quality, fast printing, exceptional value, and ease of use.